There are literally hundreds of things to do in London and chances are that you’ll struggle to cram everything into one visit! From some of the best museums in the world to beautiful green spaces and some of the best shopping, restaurants and nightlife, there’s something for everyone in London. Here’s our pick of some of the very best things to do during your stay in the city. On a budget? Why not check out our 100 Free Things to Do in London & 50 Things to do under $10. For the best time to visit the UK capital, weather and information on public transport, make sure you visit our London City Guide. When you touch down in London, there are some things which you absolutely have to tick off your list. These are our top picks for things that everyone should try and see during a trip to London. We have to start with London’s most iconic landmark, Big Ben, which actually refers to the bell of the clock, not the tower itself. Standing on the banks of the Thames, next to the Houses of Parliament, Big Ben chimes on the hour every hour, although unfortunately, it’s undergoing restoration work for the next three years. Whether you’re a diehard Potter fan or not, the Warner Bros. Studio Tour has become one of the city’s most popular tourist attractions, allowing visitors to peek behind the scenes of one of the biggest film franchises in the world and see exactly how the magic happens. With sets, costumes and props that were used in all eight movies, you can find yourself in iconic locations such as the Great Hall, Dumbledore’s office and more. One of the most iconic features of the London skyline, a trip up the London Eye gives some of the best views in town. A ride on the eye takes roughly half an hour, with stunning views of the city, and you can actually see most of the major landmarks right from the safety of your pod. Take a trip up the tallest building in the city to one of the best vantage points, the observation deck at the Shard. From 800ft in the air, you can see for up to 40 miles (64km) on a clear day, including landmarks as far away as Wembley Stadium. The official home of the Queen, Buckingham Palace, is open to visitors for just ten weeks of the year, so try to time your visit so that you get a chance to look around. You’ll get to see the magnificent State Rooms and no matter what time of year you visit you can also see the iconic Changing the Guard ceremony too. One of the most famous buildings in England, the Tower of London is home to over 900 years of history, having served as an armoury, treasury, menagerie, prison and most famously, the home of the Crown Jewels of England. You can take a tour with one of the famous Yeoman Warders, also known as the ‘Beefeaters’, who will fill you in on the intriguing and sometimes gruesome history of the castle. If you’re visiting London with kids, they’ll probably love loads of the main attractions such as the Harry Potter studios and the Tower of London, most of which are totally kid-friendly. However, we’re going to take a quick look at some of the attractions and activities that are more specifically geared towards younger visitors. 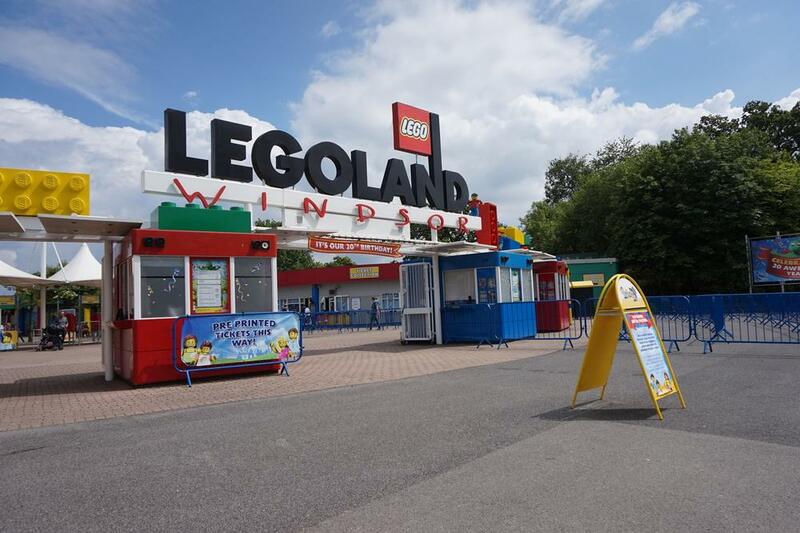 This theme park is based around all things Lego, with all kinds of different ‘lands’ for you and the kids to explore, such as the Knights Kingdom and the Lego Ninjago World. You can also see some of the city’s most famous landmarks shrunk down to Lego-size, with rides and attractions for kids of all ages, including roller coasters and log flumes. This interactive museum takes you and the kids through some of the grislier aspects of London’s history, with costumed actors on hand to lead you through events such as the execution of Anne Boleyn, the Gunpowder Plot and the murders of Sweeney Todd. Obviously, it’s a bit too scary for younger kids, but for the slightly older ones, it’s all played in a fun way, with creepy props and great special effects. Found in Regent’s Park, the London Zoo is hugely popular amongst kids, with all manner of animals to check out, from lions and tigers to the Reptile House (which young fans may recognise from the first Harry Potter movie). There are loads of exhibits which are targeted at younger visitors such as Meet the Monkeys, and they can also try they hand at being a zookeeper for the day. This brand of the Victoria & Albert Museum is dedicated entirely to kids and has a huge collection of childhood related artefacts from throughout the years, allowing youngsters to see children like them lived in years gone by. The collection includes vintage toys, dolls’ houses, board games and more. Who knows, you might even spot a few favourites from your own childhood! London is home to some of the world’s most recognisable luxury department stores, such as Harrods and Selfridges, but there’s so much more to the city’s shopping scene, including quirky boutiques and smaller street markets. 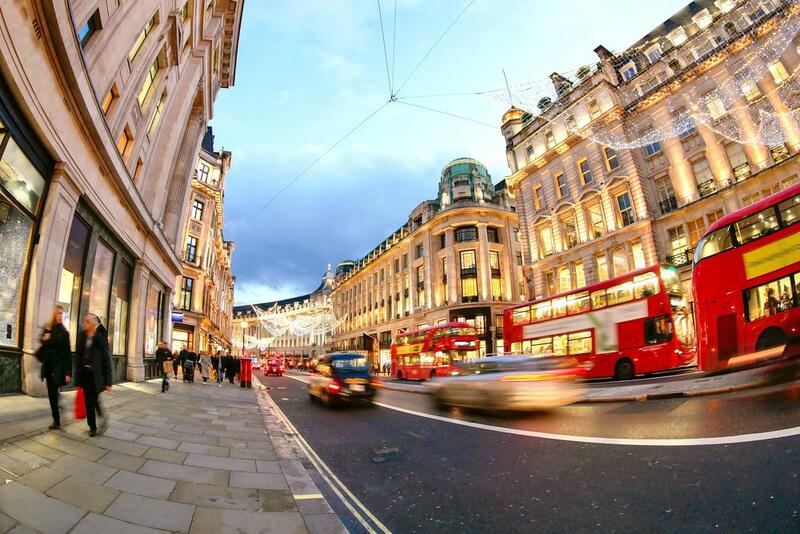 Oxford Street is the centre of London’s shopping scene, with over 300 high-street outlets, as well as the Selfridges, Debenhams and John Lewis department stores. You can also pick up a bargain at one of the UK’s favourite retailers, Primark, or check out some of the other high street favourites like Topshop, River Island and more. To see some of the city’s higher-end retailers (even if you maybe can’t afford to shop there!) head to the posh Mayfair area and check out the flashy boutiques of Bond Street. With shops from high fashion brands such as Burberry, Gucci and more, you may even be lucky enough to spot a celebrity or two as well. For bespoke men’s tailoring, Savile Row is the only place to go. It’s not cheap, but if you want a suit made the proper way, you’ll struggle to find anywhere better than Savile Row. The street is still home to some of the old-school tailors that have been based there since the late 18th century and you may also know it as the place where the Beatles famously played their last ever concert on the roof of 3 Savile Row. If you’d rather experience the more alternative side of London’s shopping scene, head to Camden Town and check out the high street, where you’ll find all manner of vintage, punk and gothic styles of clothing, amongst others. It’s also the place to head if you’re feeling brave enough to get a tattoo or piercing and is home to the Camden Market, where buy all kinds of souvenirs, jewellery and more (although much is it will probably be quite tacky!). Covent Garden started out as a fruit and veg market, although these days it contains a number of markets selling different wares, as well as a shopping centre. It’s one of the trendier shopping areas of London, with lots of bespoke gifts and fashion to check out, with some pretty stunning areas such as Neal’s Square. Covent Garden Market itself is the place to head for arts and crafts, or you can find clothing and footwear down Neal Street. You’ve probably heard of Notting Hill from the movie of the same name, but it’s also a great part of London to check out for shopping, with lots of smaller, quirky shops to discover. There’s also the famous Portobello Market, which is home to a popular street market. There are all kinds of street markets across London, selling everything from records to antiques. Some only take place on certain days of the week, but here are some of our favourites. 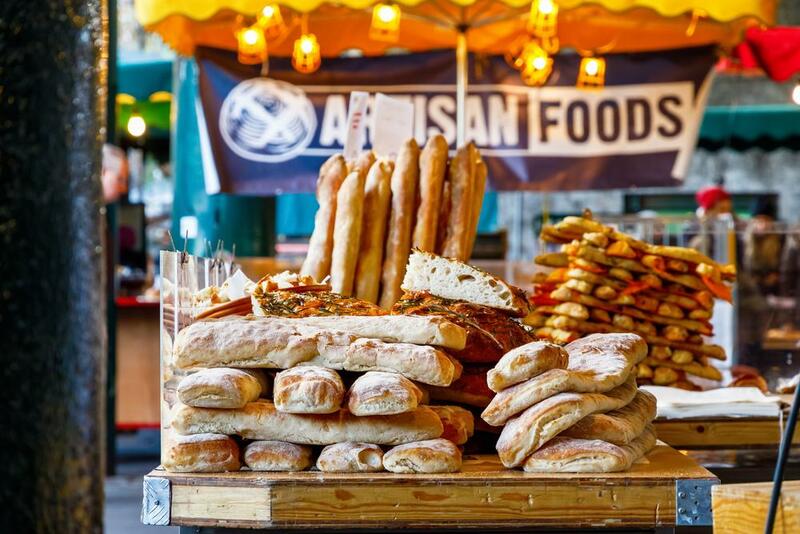 Just off London Bright, you’ll find this foodie paradise, with stalls selling all manner of fresh and organic meat, fruit, egg and cheese. There are also loads of street food stalls for you to grab a bite to eat. Brick Lane’s market is full of bric-a-brac, so you’ll have to dive deep to find the good stuff, but it’s rewarding when you do! Whether it’s vintage clothing or hidden gems that you never realised you need, you may be able to find it at Brick Lane. Brick Lane is at the heart of London’s Bangladeshi community too, so you’re sure to find lots of Asian street food and clothing here too. London’s largest antique market, Alfie’s is a real throwback to the 30s and 40s and the place to head if you’re looking for vintage clothing from that era. It’s not just clothing either, with all kinds of collectable trinkets too. There’s also a rooftop café which offers great views out over the city. One of the city’s covered markets, Old Spitalfields sells pretty much everything that you might be looking for, from independent fashion boutiques to great food and artwork too. Different days of the week will have different offerings, with Thursday being antique day and Friday the day to go for clothes or art. For unique, artisan products, head to Greenwich Market, where on a weekend you’ll find about 150 stalls, selling everything from jewellery to clothes and accessories to gifts, with a food court and lots of other local shops just off the market which are worth popping into as well. Known for its exceptionally skilled makers, you’ll find treasures at Greenwich Market that you won’t see anywhere else in the world. If you want to learn from the experts and see as much of the city as possible in one go, there are some great tours available, some of which have specific themes, others which just give a great overview of the city. 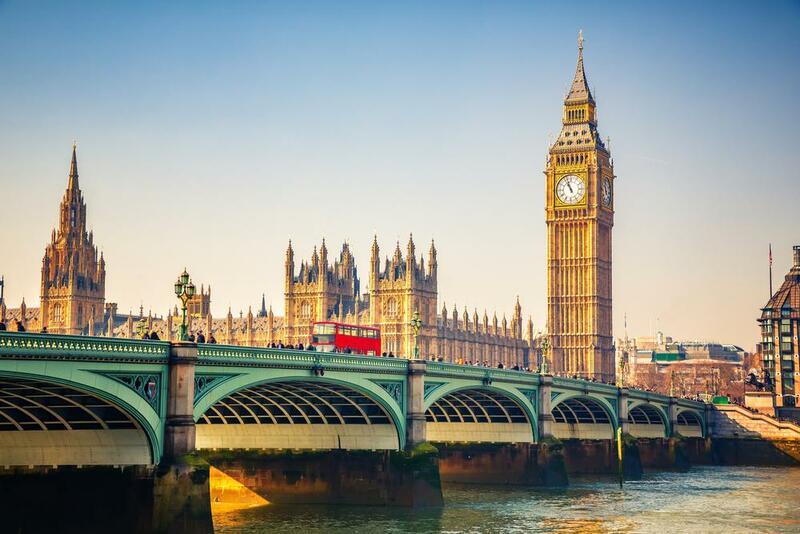 One of the most complete London tours is the Total London Experience by Golden Tours, which takes in most of the city’s top attractions, including St. Paul’s Cathedral, Buckingham Palace, the Tower of London, a trip on the London Eye and more. For £120 each (about $160), it’s a good way to squeeze in as much as possible into your visit, especially if you’re only in the city for a day or two. One of the most popular ways to see London is on an open top bus tour and there are multiple providers, each with their own routes. The great thing about these tours isn’t just that you get a great view from the top of your double-decker bus, but you can hop on and off the bus at your leisure, making it a really easy way to experience the city at your own pace. 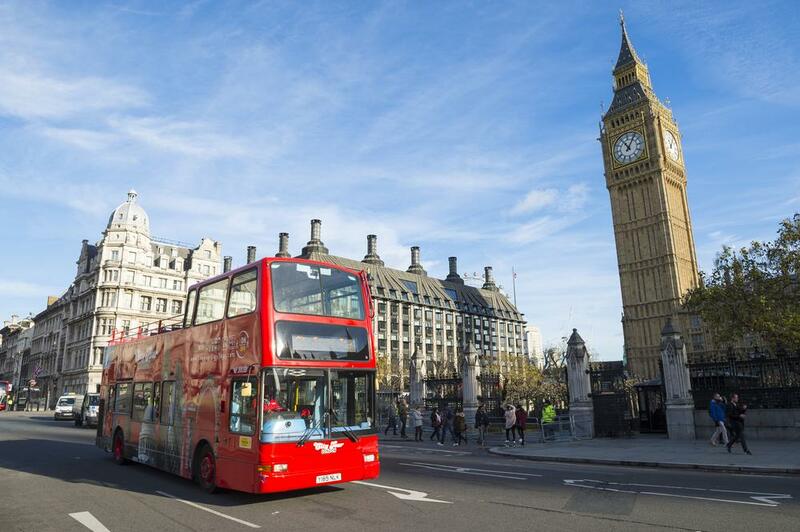 There are lots of open top bus tours which operate at night too, which gives a totally different perspective on the city, with lots of the major sights such as the London Eye, Westminster Abbey, St. Paul’s Cathedral and more looking even more spectacular when bathed in light. London is home to some of the UK’s biggest and best football teams, as well as the national team, all of which offer stadium tours which are a must for sports fans. Whether it’s the ultra-modern homes of Chelsea and Arsenal (Tottenham’s new White Hart Lane ground will be completed soon too), or the more traditional stadiums such as Fulham’s Craven Cottage, one of the oldest and most unique grounds in the world, there’s plenty for sports fans to take in. If you’d like to see the city from the waters of the Thames itself, there are plenty of river cruise tours as well. They’re the perfect way to sit back, relax and watch the world go by and many of the tours also offer you the chance to enjoy a meal as part of your journey too. There’s a real fascination with the gruesome murders of Jack the Ripper and plenty of guided tours which will take you around the very streets of East London where these unsolved crimes took place back in the Victorian Era. Not for the faint at heart, embark on these spooky tours if you dare! When staying in London you can reach plenty of other UK tourist hotspots in no time at all. Check out our comprehensive guide of Day Trips from London here. London is home to many great museums and many smaller, quirkier ones that you might never have known about too. Here are some of the best museums and historical attractions that the city has to offer. 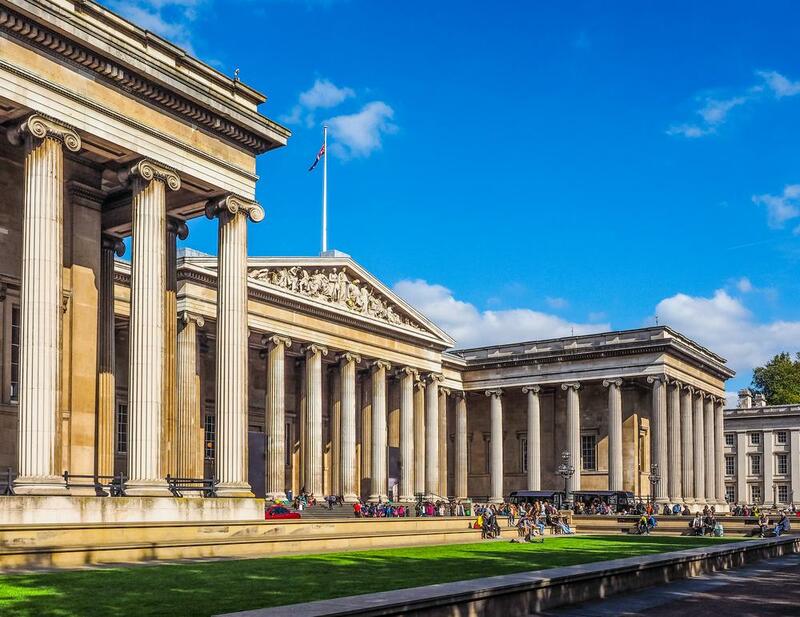 One of the most well-known museums in the city is the British Museum, home to a huge collection of rare and notable artefacts from every corner of the globe. There’s a constantly rotating series of exhibitions, but some of the most popular permanent attractions include the ancient Rosetta Stone and many examples of Egyptian mummies. This Gothic church is listed UNESCO World Heritage Site and is one of the city’s most beautiful buildings. Many notable figures have been buried here, such as Charles Darwin and Geoffrey Chaucer and it’s perhaps most well-known as the place where the Duke & Duchess of Cambridge tied the knot back in 2011. Often referred to as the V&A, this museum focuses on art and design, with a large collection of things such as fashion, jewellery, textiles and more, from over 5,000 years. It’s home to the world’s largest collection of post-classical sculpture and the largest collection of Italian Renaissance items to be found outside of Italy. Another of the truly iconic London sights, Tower Bridge was built in 1894 and there’s an exhibition centre where you can learn a bit more about its history. You can also climb up to the bridge’s walkways, 131ft above the Thames, for some great views of the city. This museum tells the story of warfare from World War I right up to the present day, with galleries highlighting everything from the roles of families during the war and the horrors of the Holocaust to the covert work undertaken by spies during wars too. This beautiful mansion in the centre of the City of London is the official home of the Lord Mayor of London, although in the past it has had multiple uses, having being built in the 18th century. There are regular guided tours around the house to see its architecture and collections of art. For such a large, built-up city, London is home to some beautiful parks. The ideal place to take a load off your feet and relax after a day of sightseeing or shopping, the parks also have plenty to see and do themselves, from sports to theatre and music productions. Here are some of the best. One of the most central parks in the city, Hyde Park is also one of the biggest, with its own lake, meadow and over 4,000 trees, which you can walk, cycle, row and even swim throughout. One of the other most popular sights is the Memorial Fountain to Diana, Princess of Wales. Regent’s Park is home to some amazing floral gardens which were designed back in the early 19th century, but it’s also got a playground for the kids, an open-air theatre, boating lake, and the largest outdoor sports area in the city too. Richmond Park feels like it’s a million miles away from central London, with a countryside feel that’s home to free-roaming deer. There’s lots of cycle paths and even two golf courses and a riding stables too. Because it’s situated quite far out of the city, you also get some great views. You’ll probably have strolled through St James’s Park if you’ve visited Buckingham Palace or Horse Guard’s Parade which sit alongside this park. Surrounded by royalty and history on all sides, it’s also known for its population of pelicans. Known as ‘Vicky Park’ by the locals, Victoria Park is actually London’s first public park and sits alongside the Queen Elizabeth Olympic Park from the 2012 games. It also hosts a couple of music festivals, such as Lovebox, All Points East and Field Day, so be sure not to turn up for a relaxing day at the park while these are on, unless you want to join in the fun! The oldest of the city’s Royal Parks, Greenwich Park was once actually a hunting park and a small group of deer still remain to this day. It’s also where you’ll find the Royal Observatory, home to the Prime Meridian Line which dictates the world’s time zones as well as some great views over the City. Many visitors come to London to visit the famous palaces of the UK’s Royal family, as well as other royal attractions. 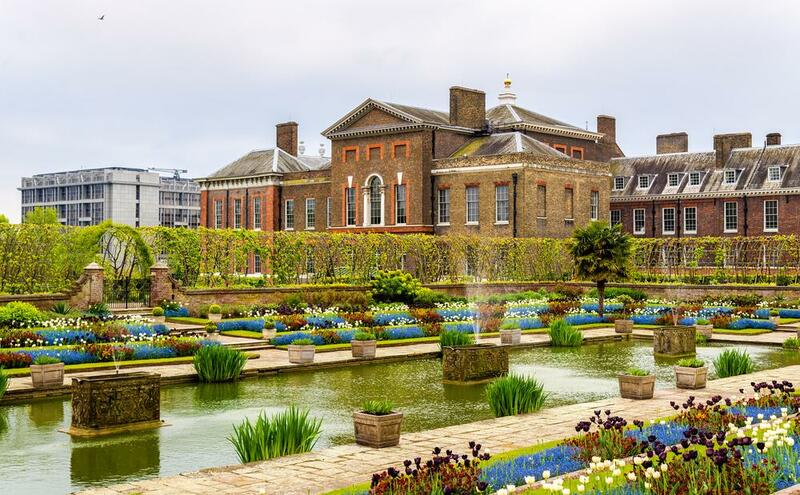 This royal residence is currently the home of William and Kate, the Duke and Duchess of Cambridge (amongst others), but has previously homed many members of the Royal family. There are regular exhibitions that you can look around, such as the Queen’s State Apartments, as well as a collection of Princess Diana’s dresses. This is where the Queen’s horses and carriages are kept and looked after and it’s also home to some of the historic carriages cars which have been used throughout the years by the Royal family. This palace is best known for one of its residents from much longer ago, Henry VIII and six of his eight wives (not at the same time, of course!). There’s tons of history here, all of which is brought to life by the costumed guides who will show you around the palace. If you want to go behind the scenes of the Changing the Guard, head to the Household Cavalry Museum, where you can learn more about the soldiers that protect the Royal family and their duties and roles. You can also see them working with their horses in the stables too. 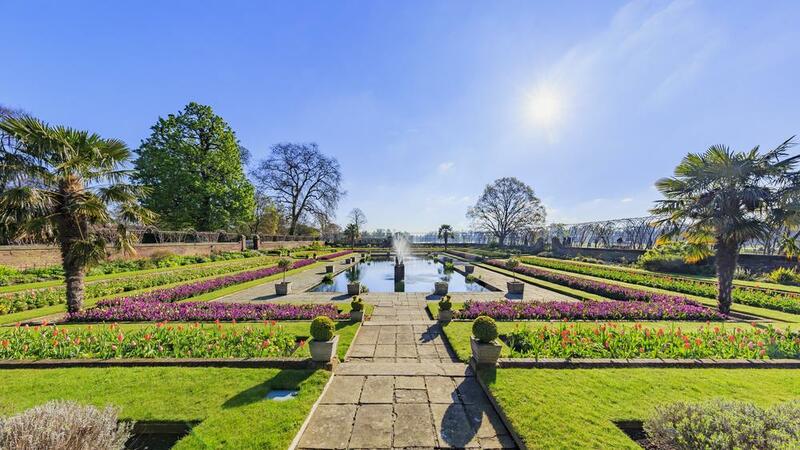 Kew is best known for its lovely botanical gardens, but the palace itself is well worth a visit too. It was primarily used in Georgian times and fell into disuse in the following years, although now it has been painstakingly renovated back to its former glories. While technically just outside London, Windsor Castle is a big draw for Royal fans, as it is the oldest and largest castle in the world that is still occupied and it’s also where Prince Harry recently wed Meghan Markle. Plus, it only takes about 30 minutes from the centre of London by train. Finally, London is also home to some of the best theatre in the world, rivalling that of Broadway in New York. And it’s not just the big-budget West End production, with lots of smaller, edgier theatres to discover. Even if you’re not a theatre lover, you should try and catch at least one production while you’re here. 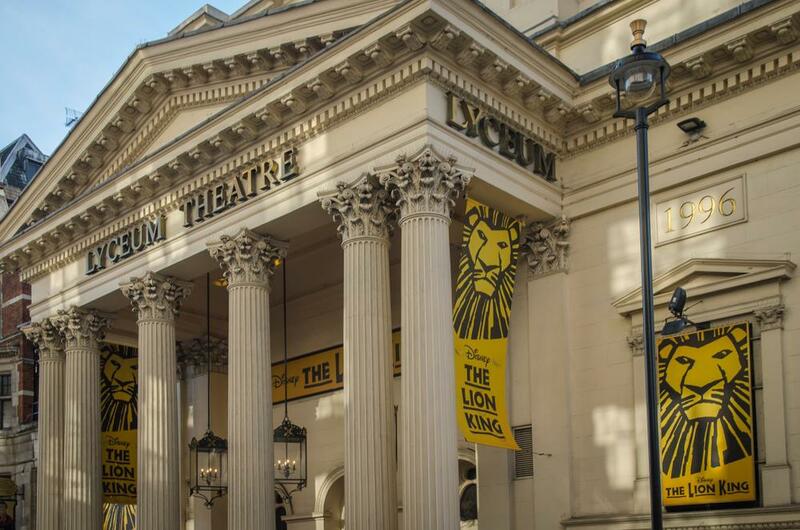 Fans of the animated Disney movie The Lion King will love this musical production at the Lyceum Theatre, which has been running for over 20 years now. Making use of actors in costume as well as impressive hollow puppets, species from across the whole Pride Land is represented and follows the journey of Simba as he becomes king, with a family-friendly show. Another Disney favourite, Aladdin is based on the 1992 movie and feature many of your favourite songs, as Aladdin aims to win the heart of Princess Jasmine with the help of three wishes from a magical Genie. The sets and costumes here are spectacular, as you would expect from the team behind The Lion King and it’s definitely worth a watch for Disney fans. Based on the novel of the same name, which is an alternative telling of The Wizard of Oz, Wicked is a wildly successful musical at the Apollo Victoria theatre, which follows the lives of Glinda the Good and the Wicked Witch of the West with a twist. With acclaimed musical numbers and having taken home countless awards on both sides of the Atlantic, Wicked truly is a must-see. A relative newcomer to the West End, School of Rock has still made a splash with its rocking soundtrack at the Gillian Lynne Theatre. Following aspiring rock star Dewey Finn as he impersonates a teacher to form a band with a group of musically gifted students, the music draws not just on the soundtrack to the 2003 cult movie, but also from West End legend, Andrew Lloyd Webber. A true staple of the West End, The Phantom of the Opera is another Lloyd Webber classic and tells the story of a mysterious ‘phantom’ who haunts the Paris Opera House and a particular beautiful soprano in particular. The amazing score, sets and special effects have ensured that The Phantom of the Opera has endured for over 30 years, so if you’re yet to see it, be sure to do so! For fans of ABBA (aka everyone), there’s only one music that should be on your radar. Mamma Mia! tells the story of a young girl attempting to uncover the identity of her father with a Greek island paradise as the backdrop. Containing a back catalogue of hits such as Super Trouper, Waterloo and Dancing Queen, you’ll find yourself singing and maybe even dancing along.